Services provided by Body Positive Inc. Body Positive provides a broad range of services for people living with HIV in New Zealand in an attempt to break down the sense of isolation HIV+ people often experience and to build a sense of community and well-being. Most services are provided free of charge and we are always keen to provide additional services and support when needed, so if there is something extra that you need, please contact us and we will do our best to assist. Body Positive House in Auckland operates as drop-in centre which is open from 9am-5pm, Monday to Friday and available to any Body Positive member to pop in and have a tea or coffee, use the internet, relax in the lounge, use the telephone, have a nap, use a clean bathroom or chat with other members and staff. Many members use the drop-in centre on their way to or from hospital check-ups and find it's great to have a rest space to go to and chat about upcoming tests or results. The drop-in centre encourages members to visit on a regular basis and also this also helps Body Positive to maintain a volunteer base. Volunteers often assist in activities such as the reception desk, condom packing (making up LYC packs) and red ribbon making (to help at fundraising or awareness-raising events). Body Positive staff have also found that the members who use the drop-in centre are then more likely to access other services offered by Body Positive, so in this sense the drop-in centre also acts as an ice-breaker that can make members feel comfortable enough with the organisation to seek out further help when necessary. 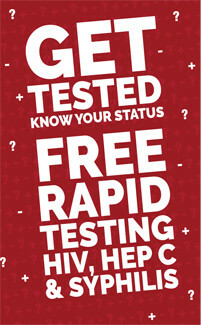 HIV testing has been revolutionised with the introduction of the HIV Rapid test. Body Positive was quick to realise the potential of the easy-to-use technology and made the Rapid tests available at Body Positive in Auckland. The HIV Rapid Test has changed the way people test because it is so quick and painless (it is similar in nature to the sugar-level tests diabetics use). Conducted by a trained Body Positive testing officer, the test consists of a simple pin-prick on one finger with a 99.2% accurate result after only 20 minutes. Body Positive runs weekly massage therapy clinics using the service of local masseurs delivering one hour massage in a quiet and private Massage Room in the Auckland Office. Many medical experts state that it is important for positive people to avoid stress or at least alleviate stress. Massage can provide this benefit. The appointment schedule of the massage clinic can often be full because it is so beneficial and affordable. A minimum koha of $30 is required for each massage, making the service within reach of most Body Positive Members. Members who are currently enrolled in the Positive Health Scheme are also entitled to four complementary massages each year. Body Positive offers special assistance with WINZ matters on an ongoing basis for all members who require help. In Auckland, Roger Pym is available to assist and advise members on request, as well as being available to members located outside Auckland via phone & email. Please contact us for further information or for an appointment. Body Positive members who are in extra need and who are in financial difficulty can access various Auckland Food Banks through the assistance of Client Services Co-ordinator, Roger Pym. An application form is filled out at Body Positive, and needs are verified beforehand. For those most in need, having to disclose their HIV status to an outside organisation is another hurdle when times are already tough. Body Positive removes that hurdle because the Food Bank request is anonymous and then we pick up the food parcel and pass it on which maintains client privacy. For a few of our members budgeting for outgoings and regular and irregular expenses is a difficult task. Body Positive has developed a service for members seeking budgeting assistance to help with their day to day finances. A WINZ benefit can be paid directly in to a Body Positive Kiwibank account expressly set up for the member and from that account a budget is established after a thorough consultation with the member. After the member approves the budget a contract is agreed and Body Positive takes care of regular payments for rent, power, accounts, fines or any other regular expense for the member. A "Living Allowance" is calculated after the bills have been settled and paid directly into the member's personal account for their personal discretionary spending. The budgeting service provides a framework for financial discipline and ensures costs associated with well-being like rent and utilities are paid for first to maintain a healthy living environment for members. Apart from adhering to your medication regime, quitting smoking is the next most significant improvement HIV+ people can take to improve their health and life expectancy. Smoking increases the risk of brain, heart and lung diseases, various cancers and opportunistic infections. If you would like to quit smoking, we can help. Body Positive has a full and comprehensive range of condoms at Body Positive. The full range of condoms is available completely free and covers many different types giving a suitable option for every preference. When arriving from outside of Auckland, it can be overwhelming being in a new city. With Positive Homestay you don’t have to feel disoriented. Your host can help you find your way through amenities, transport and to appointments. Positive Homestay is a home away from home where your comfort is in good hands. Body Positive offers podiatry clinic at Body Positive House in Auckland several times per year, utilising the services of Simon Speight BHSc (Podiatry), (Past President NZ Soc. Pod.). HIV+ men suffer more foot difficulties than most, due in part to dry-skin problems. The compromised immune systems of positive men mean extra care is needed when problems develop, because of the risk of infection. Some drugs have also been known to cause ingrown toenails. Simon Speight kindly heavily discounts his normal practice fee and charges a reduced fee of only $45 for each consultation/treatment at the Body Positive clinic which represents over a 50% discount. Members who are currently enrolled in the Positive Health Scheme are also entitled to three complementary treatments each year.